Inspiration: The majority of any audience at SolidWorks World are Engineers. Over and over again, Engineers would approach me (an Industrial Designer) and share stories of their frustration with working with Industrial Designers. I, frankly, had similar experiences in the reverse working with Engineers. Working at the DiMonte Group, where Engineers and Industrial Designers work in tandem on our design projects, we have learned how to get past these issues by developing an understanding and respect for the requirements and responsibilities of each others disciplines. I thought everyone could benefit from a frank discussion about the stereotypical disconnect by first laying out and exploring the biases, deconstructing them, then share collaboration techniques that work because they are based on respect and understanding of what the other field has to do. “The Wrath of Scotty” title was an attempt to poke fun at and show respect for the main complaint I heard from Engineers – that the ‘idiot’ Industrial Designer asked them to do something that was impossible and that, just like Scotty on the Enterprise, they somehow had to make a miracle happen. Abstract: How can Engineers work with the curvy models delivered by Industrial Designers? 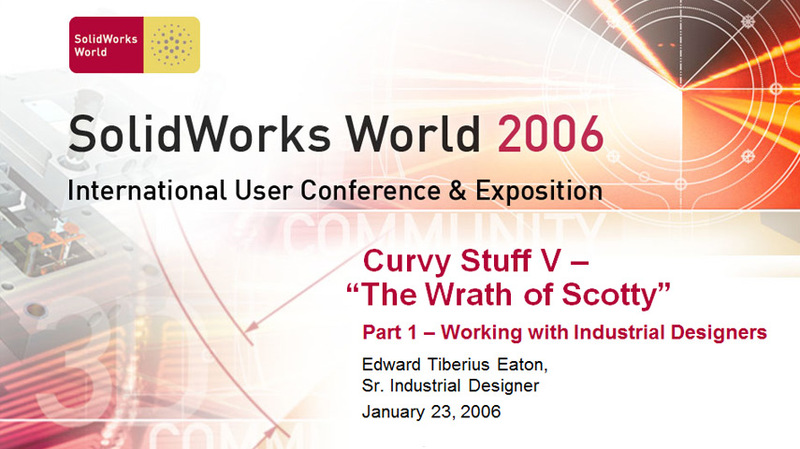 Part 1 focuses on the differences in the disciplines of industrial Design and Engineering and why their models so often seem incompatible, It provides an understanding of what causes the other camp to model “that way” and presents modeling strategies, tips and tricks to ease collaboration on curvy products and pulling critical to function dimensions from the Industrial Designers model into the drawing. Benefit: Both Engineers and Industrial Designers will learn how to better collaborate with each other and share a common SolidWorks database that caters to the professional requirements of both disciplines.